BOSEONG, South Jeolla Province ― Since being first introduced to the country in the early ninth century by merchants returning from China, green tea has acquired a long history and rich culture in Korea. 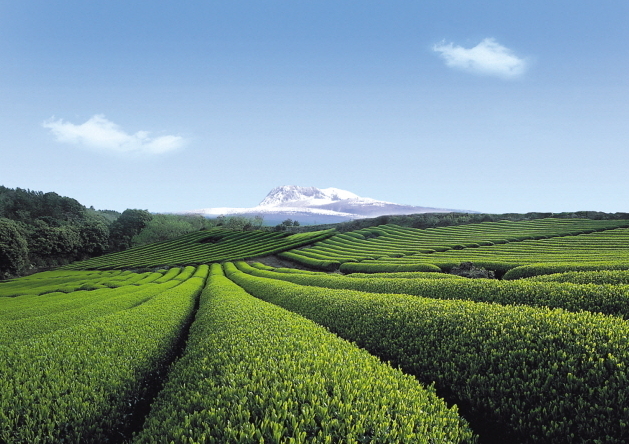 Today, one of the nation’s best-known green tea plantations is the Daehan Tea Plantation here. The vibrant green tea fields of Boseong attract around 1 million visitors every year, who come to experience green tea in its most natural state while marveling at the beauty of the fields’ picturesque hillside appearance. A walk through Boseong’s labyrinth of green tea fields, which are spread out over some 560 hectares, is an unforgettable experience. 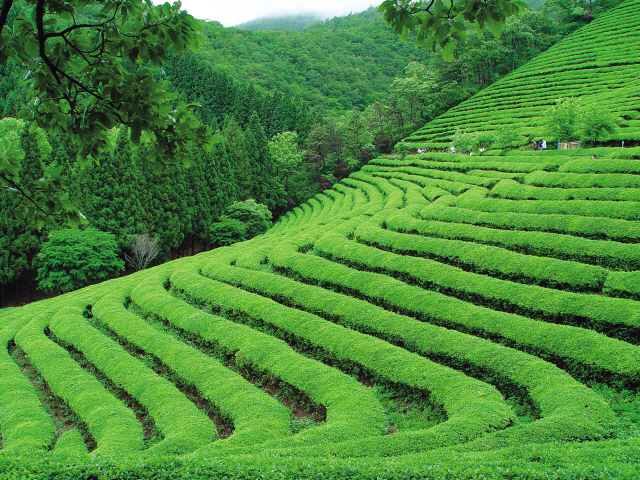 Nestled in the center of a heavily forested area, the plantation features row upon row of green tea plants in a wavy pattern, giving it a maze-like feel. In between each row are narrow paths where visitors can wander touching, picking and smelling some of the nation’s premier tea leaves. In the springtime when the plants begin to flower, the fields give off an intoxicating scent. “Boseong’s tea has a unique taste unlike any other tea because the tea plantation is located 100 meters above sea level, and the cool breeze that comes in from the ocean as well as the mist changes the air temperature of the area,” said Choi. Surrounding the plantation is a never-ending array of cedar trees, providing natural shade for the leaves. “The tea leaves grown here are also distinct in the fact they are hardly ever exposed to any direct sunlight, which is not good for the leaves,” she explained. The vast Daehan plantation was established in 1939 during Japan’s colonial rule over Korea. After Korea’s liberation in 1945 and the subsequent departure of the Japanese, the plantation was left abandoned until a Korean entrepreneur purchased the neglected fields and created the Daehan Tea Plantation. Boseong was originally selected as the most ideal place to produce green tea because of the area’s deep and fertile soil, as well as its location near Yulpo Beach. This makes for an ideal climate that is cool and moist. Due to its premier location, the green tea that is produced in Boseong has a distinguishing aroma, as well as a full-bodied taste. roasting process of the leaves, and also when the tea leaves are picked. Ujeon green tea is made from young tea buds and leaves picked around late April and is the most expensive, averaging around 70,000 won to 130,000 won per pack. Sejak green tea is typically considered the next best grade of green tea and is made of young tea leaf buds hand-picked between the end of spring and the start of summer. Sejak green tea averages around 30,000 won per pack. Boseong is considered the birthplace of the commercial tea industry in Korea and is the largest producer of tea in the nation, accounting for approximately 40 percent of the country’s total green tea production. The plantation is one of the country’s most visited, thanks to an annual green tea festival Boseong has hosted for the past 39 years. The Boseong Green Tea Festival, one of Korea’s major tea festivals, is typically held in May at Korean Tea and Sori Cultural Park. 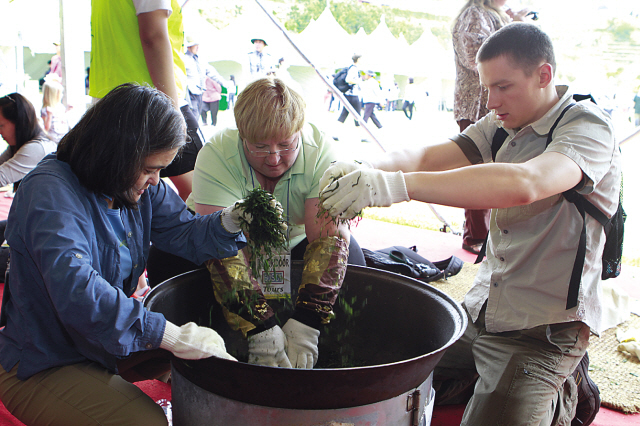 Some of the most popular events held during the Boseong Green Tea Festival include going out into the fields and picking tea leaves, then learning how to roast them. Participants also have the opportunity to sample all sorts of green-tea-infused snacks and drinks. The annual festival also features a hanbok fashion show, music performances and various hands-on programs such as tea bowl making, tea-based food making, green tea beauty and health experiences, green tea rice cake making, green tea sampling, green tea soap making and more. Aside from the popular springtime Boseong tea festival, the plantation also hosts a special winter festival for guests to experience the field at night. “Visiting the fields during the Boseong Green Tea Light Festival in the wintertime is also a truly a wonderful experience,” said Choi. One of the highlights of the winter light festival is the 120-meter-high “Millennium Tree,” which is decorated with more than 100,000 lights, making its way into the Guinness Book of World Records in 2000. The citizens of Boseong have managed to infuse green tea in very aspect of their lives. Along with the county’s bountiful production of green tea drinks, cakes, cookies and ice cream, one of the areas main local dishes is nokcha samgyeopsal, grilled pork belly from pigs that are fed green tea leaves. To get to Boseong from Seoul, visitors can take a bus or train to Gwangju and from there, transfer to a bus heading to Boseong Bus Terminal. Otherwise, there is only one direct bus service to Boseong from the Express Bus Terminal in Seoul, departing at 3 p.m. Total travel time for any method of transportation is roughly five hours. Another of the nation’s bustling green tea plantations is Jeju Island’s Seogwang Tea Field, located next to the O’Sulloc Museum, which annually attracts more than 1 million visitors per year. 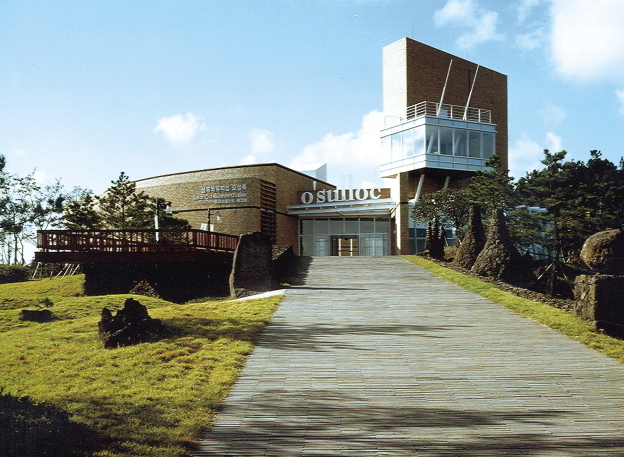 O’Sulloc tea is the signature tea of Jeju Island and is appreciated for its distinct flavor. The Seogwang Tea Field is located in the southern region of Jeju Island and its tea leaves are one of the origins of O’Sulloc green teas, one of Korea’s most familiar brands of tea, produced by the cosmetics giant Amore Pacific Corp.
Aside from the plantation and the tea museum, O’Sulloc has also established a chain of tea houses that serve green tea concoctions such as straight latte, soda, and shake variations to name a few as well as green tea cakes and desserts. Even skin care products made using green tea are sold at the O’Sulloc Tea House. For those who wish to experience its distinct taste without leaving the peninsula, there are currently four branches of O’Sulloc Tea House in Seoul: in Myeong-dong, Gangnam, Jongno and Daehangno.